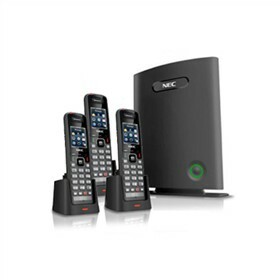 The NEC 730653 is an AP20 access point for the ML440 Cordless Handset. This powerful PoE Access Point can register up to 30 ML440 cordless phones and 10 calls simultaneously providing your wireless handsets with a range of up to 100 yards in an unobstructed environment. Eight handsets per access point in multiple AP20s are installed. A maximum of 20 AP20 Access Points are allowed per system and is compatible with both SL1100 and DSX Phone Systems. Please note that if you are purchasing your first AP20 Access Point, this bundle does not include the required VoIP Daughter Board. For a starter kit that includes the VoIP Daughter Board, please consider the ML440 Multicell Kits in our DECT Wireless Systems category. The NEC 730653 has many exciting features for users of all types. The NEC 730653 is sold as a Brand New Unopened Item.